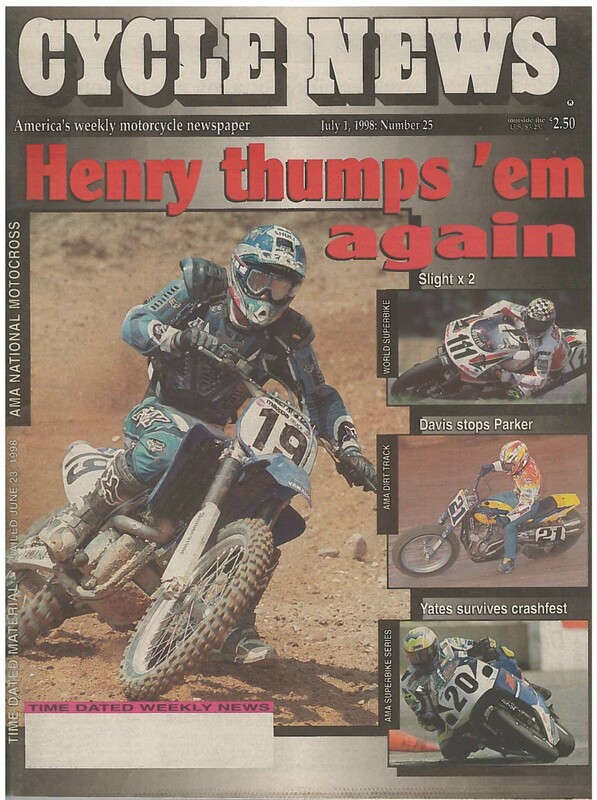 Good Times MX Park, near San Antonio, Texas, held a AMA 125/500 National, and Rick Johnson of the Honda factory team was the winner in the big-bore class. He went 2-1 to Kawasaki's Jeff Ward's 1-2 and won on the second moto tiebreaker. Third went to Kawasaki Support rider Mike Fisher. In the 125 Class, Team Honda's Micky Dymond, the reigning class champion, topped fellow CR125 rider Guy Cooper and Yamaha-mounted Australian Jeff Leisk. Also on this day in 1987, Mark Hyde won his fourth Blackwater 100, a record that would stand forever, in the notorious West Virginia test of survival. 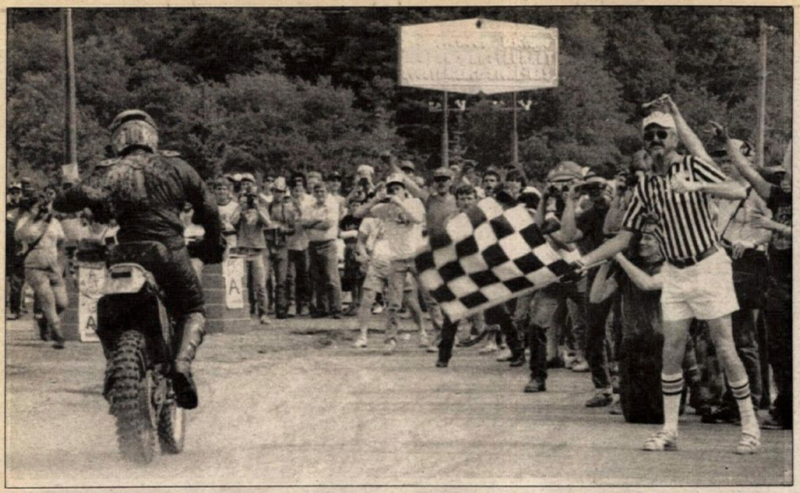 Held in Canaan Valley, "America's toughest race" featured mountain climbs, river crossings, swamp bogs, and thousands upon thousands of partying spectators, who attended for free because the race started and stopped in the middle of the tiny town of Davis. Following the Husqvarna home in the more-than-500-rider field was Wally Wilson and Tommy Harris. Captain Russ Bennett throws the checkered flag on Mark Hyde as he wins his fourth Blackwater 100. Team Honda's Chuck Sun, the reigning AMA 500 National Champion, went 5-1 to become the second American to win the 500cc U.S. Grand Prix at Carlsbad Raceway. Sun outpointed "Bad" Brad Lackey's 6-3 scores and British rider Graham Noyce's 3-6. 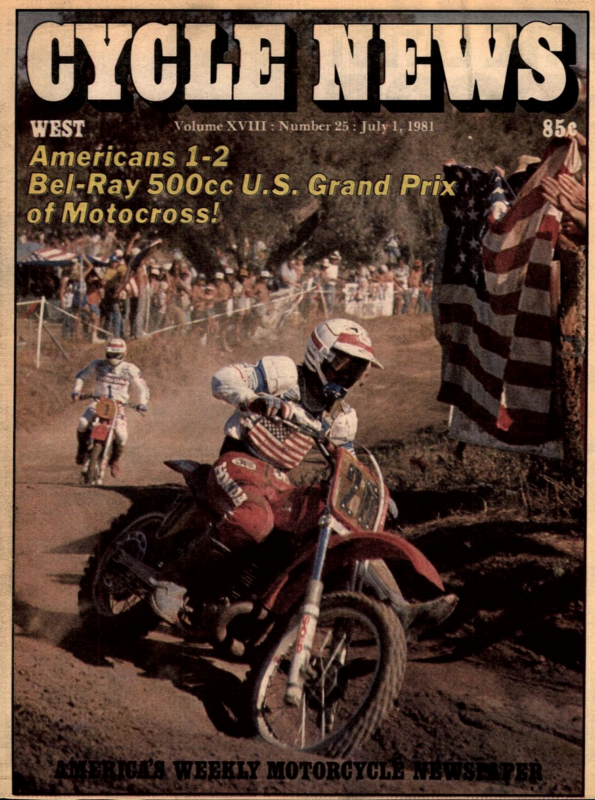 The winner of the first moto was Yamaha's Broc "Golden Boy" Glover, but he crashed early in the second moto. His Carlsbad win would have to wait until 1983. And check this out: Honda sent three factory riders to Carlsbad to race the 250 Support class. 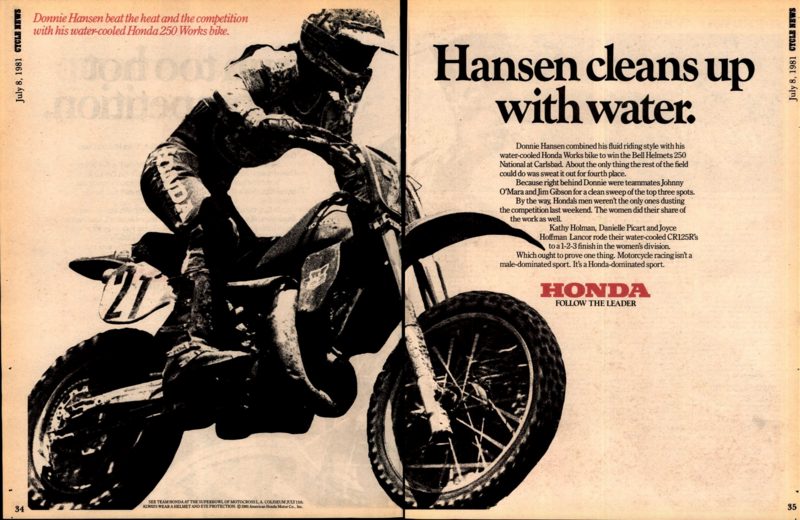 Donnie Hansen, Johnny O'Mara, and Jim Gibson went 1-2-3 on their works, water-cooled Hondas. Doug Henry returned to Budds Creek, a track that bit him hard—twice—and won aboard his big Yamaha thumper, going 2-1 to the 1-4 of his Yamaha teammate Kevin Windham and the 3-3 of Suzuki rider Mickael Pichon. In the 125 Class, defending champ Ricky Carmichael raced his Chad Watts-tuned Pro Circuit Kawasaki KX125 to 1-1 moto finishes. Honda of Troy's Mike Brown would place 3-2 for second overall while Yamaha's John Dowd went 4-3 for third. We couldn't find the race coverage online, but we did find this recap film compilation someone made of 1998. It was worth it to see the bizarre crash at the beginning that Team Stiffie's Jeff Willoh had when his throttle seemed to stick wide open off the start at Hangtown when it used to be a right-handed 45-degree turn. He slammed the fence, but somehow no one was hurt!